It’s two months-plus since my knee replacement and I’m finally be able to cook again — yay! In the last year, anything that involved standing or walking made me wince and have to sit down. I’d been relegated to a sous chef; I could chop things sitting at the table while Bob handled the stove and oven. I do like to cook and bake, so I missed it. Last night for dinner, I threw together a chicken salad, after having had a little of someone else’s at a party the night before. Nothing so remarkable about that, really, making dinner, ho hum, but then I realized when I’d finished and it really was quite tasty– hey, I just threw this together without a recipe! And that’s the part that amazes me when I think about it… that I’ve cooked enough over the years that I have a pretty large repertoire of things I can cook/bake/make without going to a cookbook or the Internet. A chicken salad isn’t very difficult, but I played with it, adding halved grapes and apple chunks, celery, onions, cucumbers. Through trial and error, I’ve learned that I don’t want just straight mayo as the dressing– after reading labels of other deli salads I’ve liked, I discovered adding a bit of Dijon, some splashes of white vinegar, salt and pepper (I am a pepper fiend, always use it, but not overuse), and a few pinches of sugar. Just a little sugar takes the acidity of the mustard and vinegar down a notch. I added water to thin the dressing. Tossed into the salad, it was great. I started cooking when I was a kid, the oldest daughter helping mom in the kitchen. It was the ’70s, the time of the Boxed Everything foods, so I learned to make Jell-0 and pudding and mac-n-cheese and Hamburger Helper. Mom regularly baked cookies from scratch, so I learned to do that, graduated to baked chicken and chili. I took some summer cooking classes and learned that I could just try out recipes on my own. I tried a Baked Alaska that melted some in the oven, and a 3-layer butter cake with chocolate icing. I guess it’s been a long education since I’ve been cooking most of my life, and became the chief chef for my family over 20 years ago. For the most part I like cooking, but there have been days or weeks where I can’t stand it and it feels torturous to have to think about what to make for dinner all the time. And certainly not everything turns out– my family likes to mention “Chard Cheese Pie” to tease me (bleah, tasted sour, despite the glowing recipe intro that said what a favorite it was– not for us!). And there was “Swamp Soup,” a green zucchini-based kinda slimy soup that only one of us liked– my older son who was about 8 at the time and didn’t like a lot of things. Go figure. It feels fun and creative when I can just whip something up, throw it together, use what I’ve learned through trial and error, add a little of this or that to something to change it up. It’s best when it works and tastes great, but even with the mistakes, at least I’ve learned something. 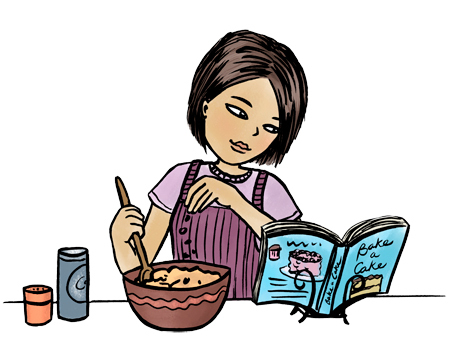 I still use recipes a lot of the time — and I’ll give a big grateful shout-out to the Internet, that endless source of recipes, just search any old ingredient, woo hoo! But sometimes I just get my groove on with my intuition, my Spidey-sense about what I could add to make this taste better, part chemist, part artist, part crazy cook. And then we get to eat!